Nordic pole walking now has a foothold in New Plymouth. National Nordic pole walking coach June Stevenson shows New Plymouth man Ron Rickman the proper technique. National specialist coach, on behalf of the International Nordic Walking Federation, June Stevenson was in town last week to teach people the proper technique. It is a type of fitness exercise where people, aided by specialised poles in hand, use 90 per cent of their muscles. Although here for several sessions, including ones for the public, Mrs Stevenson also spent time with members of the Parkinson's Society Taranaki. Nordic walking has many benefits including improving postural stance, helping with depression and strengthening the body. "Nordic walking is a natural intensification of how we should naturally walk," Mrs Stevenson said. "Most of us, when we go for a walk, we're often walking with bad posture. The ability to move well, particularly using the upper body, has been lost." 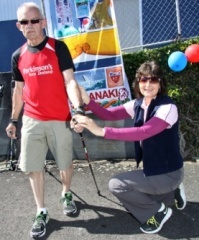 One member of Parkinson's Society Taranaki, Ron Rickman, has been a nordic walker for about five years. "When I started I could barely walk up the Huatoki hill to the school," he said. "Now I can beat almost anybody up there." Mr Rickman has just completed the Taranaki Daily News Half Marathon and did it, using nordic pole walking, in three hours and 17 minutes. Benefits, for him include more energy, better brain activity, more self-motivation and a better frame of mind. "I'm just living life," he said. Mrs Stevenson's visit coincided with Parkinson's awareness week.